Legal capacity is a legal determination, not a medical determination. A doctor’s assessment or opinion can assist us, but it is up to the lawyer or legal advocate to determine capacity. 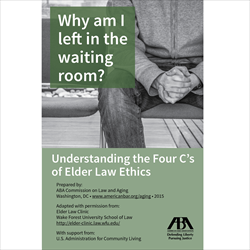 As a legal advocate for older adults, it is important to assess whether there is incapacity, and whether it is a temporary situation (e.g. – acute medical condition, mitigating factors such as grieving, depression). 3. A final legal judgment about capacity by the lawyer (or ultimately a Judge). In fact it should be rare to have a formal evaluation by a clinician. It will usually be up to you. You can’t just send your client to their doctor for the administering of the Mini-mental State Exam (MMSE) and then have the doctor tell you based on their score whether they have capacity or not. First of all, that isn’t what the MMSE is for. Secondly, it is your call, your assessment. But they didn’t train you how to do this. What should you do. As a practical matter, in assessing a client’s capacity to execute a legal document, lawyers generally ask the question, “Is anyone going to challenge this transaction?” If a client of questionable capacity executes a will giving her estate to her husband, and then to her children if her husband does not survive her, it’s unlikely to be challenged. If, on the other hand, she executes a will giving her estate entirely to one daughter with nothing passing to her other children, the lawyer must be more certain of being able to prove the client’s capacity. While the standards may seem clear, applying them to particular clients may be difficult. The fact that a client does not know the year or the name of the Prime Minister may mean she does not have capacity to enter into a contract, but not necessarily that she can’t execute a will or durable power of attorney. The determination mixes medical, psychological and legal judgments. It must be made by the lawyer (or a judge, in the case of committeeship determinations) based on information gleaned by the lawyer in interactions with the client, from other sources such as family members and social workers, and, if necessary, from medical personnel. Doctors and psychiatrists cannot themselves make a determination as to whether an individual has capacity to undertake a legal commitment. Assessing legal capacity requires a legal determination. But medical professionals can provide a professional evaluation of the person that will help a lawyer make this decision. Because you need a third party to assess capacity and because you need to be certain that the formal legal requirements are followed, it can be risky to prepare and execute legal documents on your own without representation by a lawyer. You want to meet alone if at all possible with the older adult you are assessing, to ensure there are no influences or assists from others. The American Bar Association and the American Psychological Association recognized this problem, and came up with a solution. 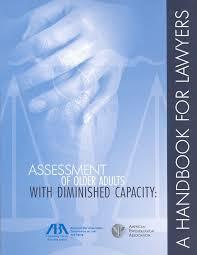 The Handbook for Lawyers – Assessment of Older Adult With Diminish Capacity recommends a procedure for conducting an assessment and contains a suggested capacity worksheet. • It reviews the legal and medical models of capacity. • It suggests how to enhance capacity where possible. 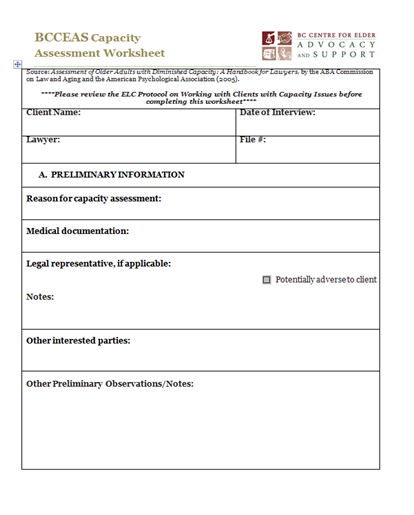 • It discusses when and how to refer for medical assessments. 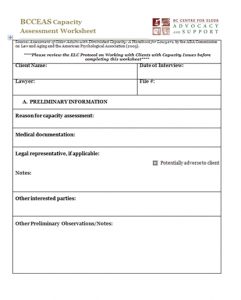 • Finally it helps with using and understanding capacity assessment reports. • Transaction-specific elements of legal capacity;. • Preliminary conclusions about client capacity. Focus on decision making abilities, not cooperativeness or affability. Pay attention to changes over time; history is important. Beware of ‘ableism’ and ‘ageism’ stereotypes. Consider whether mitigating factors could explain the behavior. does not automatically mean that they lack decisional capacity. Remember, legal capacity is always task and time specific! Forgets what is discussed within 15-30 min. NB – be cautious of assuming a client’s fear is due to a delusion rather than the result of actual abuse/ threat to client’s safety. History of the relationship – best new friend? See our webpage on undue influence to see a tool for identifying and assessing the risk of undue influence. Can you describe what a will is? Who are the objects of your bounty? Nature and extent of assets? Describe basic plan for distribution. Is decision consistent with client’s long-term values or commitments (if known)? Is the decision objectively fair? Will anyone be hurt by the decision? Does anyone substantially stand to benefit? Could the decision harm the client or someone else? Can client articulate reasoning leading to this decision? 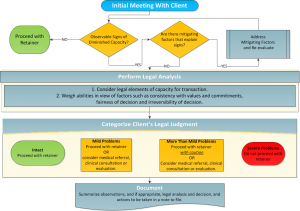 Can client appreciate consequences of his/her decision? For those who prefer, here is a flow chart setting out the capacity assessment process. Consider Informal mental health consultation?